You might be interested in learning CNC programming basics. Let's start with g02 circular interpolation example. CNC programming codes are easy to understand even for beginner level CNC Machinist and CNC Programmers. Below is the CNC programming examples with Drawing. G92 CNC Code: Which was mostly used for older machines. 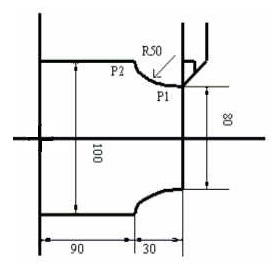 G92 CNC code is utilized to demonstrate the machine where the zero-point of the program is. G96 CNC Code: Constant surface speed. G02 CNC Code: Circular Interpolation Clockwise, CW. You must know the present location of the machine instrument as for the part, the point where the circular segment will end and feed rate at which you need to cut the curve. Additionally, you need to know the location of the circular segment with respect to start point of the arc. The begin purpose of the circular segment(arc) is that point to which you move the machine where the bend is to start. Imagine vertical line and you are moving along the line from base to top. As you get to the finish of the line you can swing to left or you can swing to the right. Regardless of whether the arc turns to one left or right is determined by the center of the arc. For example, you are moving to the right on horizontal line and at the end, you want to draw an arc. Then the center of an arc would be on the Y axis, either +Y or -Y. The Commands which tell the machine about the center of an arc are I, J and K command. X: Endpoint of arc in the x-axis. Z: Endpoint of arc in the z-axis. I: Distance from arc start point to arc center point in the x-axis. K: Distance from arc start point to arc center point in the z-axis.